RULE OF SIX got together around late 2012. Formed by WAYLANDER‘s wielder of all folkishly fiendish instruments (see what I did there??? 😛 ), Dave Briggs. He was soon joined by his former RUNECASTER bandmate, Tom Morrison and the pair began to assemble a band that would include no less than four guitarist. Their first two-track “Promo” was released in late 2013 and distributed freely by the band at gigs and on request. And in early March 2015 the band released their second “Promo 2”, containing four brand new tracks of glorious, fist-pumping metal. You’d think with four guitars it might run the risk of being sloppy and incoherent. 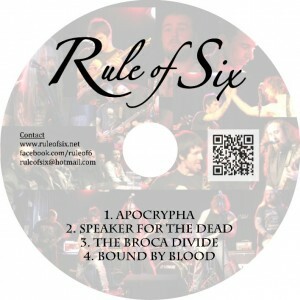 But on the contrary, RULE OF SIX pull it off brilliantly. Opening track ‘Apocrypha’ sets the tone perfectly right from the off. The harmonised lead and rhythm guitars merge together to create a style not a million miles away from modern day IRON MAIDEN‘s three guitar attack. ‘Speaker For The Dead’ picks up the pace a bit and ‘The Broca Divide’ has a more melodic approach, with both tracks letting the band’s multi-layered guitar work really shine. There literally isn’t a hair out of place. It’s very easy to get carried away by all the guitar harmonies, riffs and solos, but it’s all for naught if the backbone rhythm section doesn’t keep it all together. And Den Ferran and Jack Luke accomplish the perfectly, never falling into the background and driving each track onward in a familiar Harris/McBrain fashion. ‘Bound By Blood’ isn’t as instant as the first three tracks, but is still another very solid track and brings the ‘Promo’ to suitably rocking end. Definitely a band worth checking out…!!! 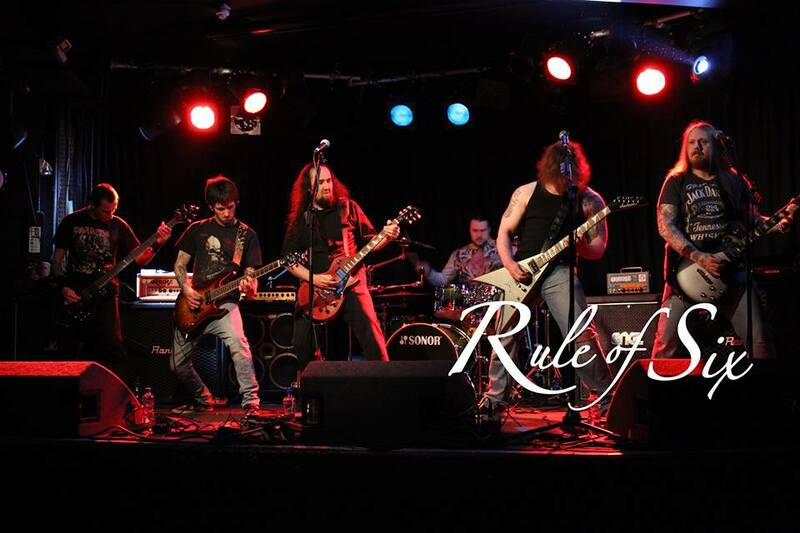 RULE OF SIX recently won the second heat of the Northern Irish ‘Bloodstock – M2TM’ competition last weekend (7th Mar 2015) to go through to the semi-final stages and keep their hopes of playing at this years Bloodstock Festival 2015.